The risk that arises from rouging is that product contamination, through the presence of particulates, could occur. To add to this, there is an impact on water quality for rouge may be the source of contaminants that lead to the chemical deterioration of water quality. Furthermore, buildups of rouge byproducts can lead to operational problems including blockages in filters. 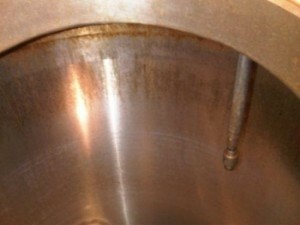 If more severe localized corrosion (pitting) occurs, this can lead to more serious operational issues. With regard to this subject, Tim Sandle has written an article for the Journal of GXP Compliance. The article can currently be accessed here. Alternatively please contact Tim Sandle.